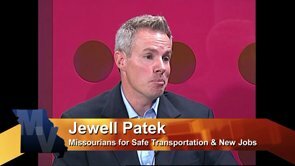 That’s because two consulting companies run by the campaign manager, Jewell Patek, a former Republican state representative from Chillicothe, have been paid at least $160,175 by a campaign committee called Missourians for Safer Transportation and New Jobs. That’s more than six times the $25,000 that our opposing campaign committee, Missourians for Better Transportation Solutions, has raised altogether. To me, it just shows what a special interest slush fund Amendment 7 would be, if voters approved the new 3/4 cent sales tax next Tuesday. The “New Jobs” committee has raised more than $4 million, with much of it coming from the construction, heavy equipment and concrete and asphalt industries. The investment is chump change, however, for industries that would reap hundreds of millions, or billions, of dollars from transportation projects throughout the state. And the first thing they did was to hire a former legislator — Patek — to be their front man. I heard the guy on the radio yesterday, and he’s not very impressive. Not a hint of passion in his voice. Of course, it’s pretty hard to sound convincing when you’re trying to sell a bag of horse turds at the farmer’s market. :: I’ve been on the sidelines as far as Question A, the proposed streetcar-district expansion, is concerned, but it just doesn’t seem to be catching people’s imaginations. I think too many questions loom about funding. A lot of people don’t understand the deal between the state and the city, which calls for $124 million of new state-sales-tax revenue to go for the streetcar expansion, if Missouri voters approve Amendment 7 and streetcar district voters approve broader streetcar district boundaries. Under the terms of the deal, residents within the expanded district would pay only one cent per dollar more in sales taxes, instead of 1 and 3/4 cents more, if both the state and streetcar tax increases somehow passed. There are two other complicating factors: 1) the actual vote on the sales-tax increase within the streetcar district wouldn’t take place until November, and 2) another tax proposal — the proposed 20-year extension of a half-cent-sales tax for firefighters — is also on Tuesday’s ballot. :: The Star did a great job on its “Voter’s Guide,” published in today’s “816” Missouri-side neighborhood section. It contained 14 full pages of election coverage — almost everything readers and prospective voters would need to be able to go into the polling places and understand the issues and know something about the various candidates. But you know what was shocking? It contained only one political ad. That was a four-column, top-to-bottom ad against Question A, the streetcar proposition. In years past, candidates and campaign committees working both sides of issues viewed the Election Guide as a golden opportunity to get the attention of frequent voters at reasonable ad rates. But obviously the section seems to have lost its lustre as an advertising vehicle. Instead of making good money on the section, The Star almost surely lost money on it this time around. Ah, my old paper…it just seems to be fadin’ into the gloaming. Over the last several years, about a half dozen former reporters and editors at The Kansas City Star have bailed on the paper and gone to work at the University of Missouri-Kansas City as the university launched an aggressive effort to raise its profile and enrollment. The first to go — and the highest-ranking person — was then-Assistant Managing Editor Anne Spenner, who ran The Star’s Metro desk for several years. Others followed her, including several reporters and editors from The Star’s features section, which Spenner headed before moving to Metro. Back at The Star, her move left some people wondering if she had made a mistake because her newspaper career appeared to be on an upward arc. In making the change, however, she must have decided that the cracking foundation underpinning the newspaper business didn’t bode well for the long term. So, she bolted and soon started hiring other Star staffers with whom she had worked closely. For all of them, the horizon looked bright…until yesterday. Now, Spenner and some of the others who left the paper must be second-guessing their decisions to leave the paper. Reporting and writing the story were Mike Hendricks, a former Metro columnist who returned to reporting a few years ago, and Mara Rose Williams, The Star’s longtime education reporter. One academic study, published in the Journal of Product Innovation and Management, rated the Bloch school the top business school in the nation, ahead of such universities as Harvard and Stanford. The Star blew the lid off that report and others. At the time that study was written, the reporters said, “the two authors were working on the UMKC campus as visiting scholars at the Bloch School.” The authors also had close ties to a UMKC professor with whom they had previously worked at a Chinese university, and they apparently structured the study so that the Bloch School received the top ranking. One of the people who couldn’t weasel out of talking to the reporters was university spokesman John Martellaro, himself a former Star reporter and editor. Martellaro was paraphrased as saying that UMKC was not embarrassed by the disclosures of impropriety. Hendricks and Williams completely disrobed the Bloch School, however, and nothing that any university spokesman says can dress it up. Years ago, when the newspaper business was going strong, most of us reporters and editors would scowl when asked about the possibility of moving to public relations jobs. We wouldn’t “go to the dark side,” we vowed, where we would have to “spin” facts in favor of the institution or company that was paying our salaries. As the newspaper business faltered, however, many reporters and editors had to change their tune and seek haven in the world of public relations, promotions and marketing. I can’t blame Spenner and the others who went to UMKC. It would be reasonable to think that you could hold your head high while working at the biggest university in western Missouri. But, no, cheating takes place everywhere, even at institutions of higher learning. The whole mess makes me very glad that I was able to squeeze out a career in the newspaper business. I made it to 60, got the pizza and sheet-cake retirement party and drifted happily off into substitute teaching, golfing, blogging, political activism and volunteer work. I realize, though, that if I had been born in the ’50s or ’60s, instead of the mid-1940s, I might have been the guy who had to try to maintain a straight face and tell Hendricks and Williams that UMKC was not embarrassed by a full-fledged scandal. 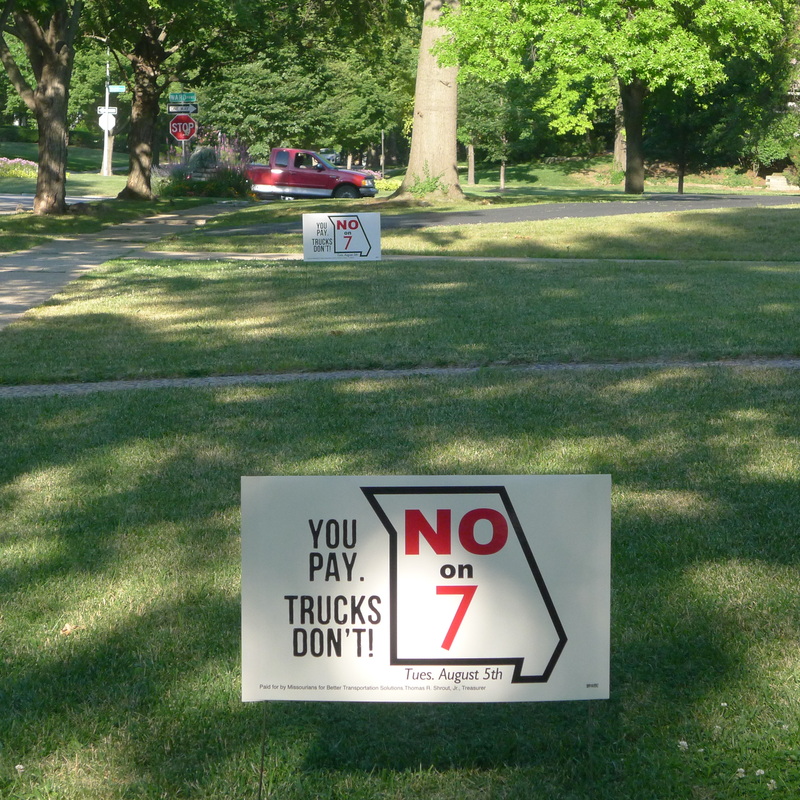 The “No on 7” campaign is now in full swing, with yard signs flying out of my car trunk; fliers being distributed; 60,000 pieces of campaign literature about to go out to St. Louis area voters; and the proposed constitutional amendment getting hammered in the letters to the editor section of The Star. To me, the point about the trucks is perhaps the biggest vulnerability in the proponents’ argument in favor of a new 3/4 cent sales tax to finance transportation projects statewide. It’s almost incomprehensible that the proponents would try to sneak past the voters a huge sales-tax increase that would give the trucks — which do the most damage to our highways — a total pass. It’s definitely an insult to the intelligence of the Missouri voters. The “insulters” are the General Assembly majority that got this on the ballot and the special interests that would benefit from spending, oh, about $6 billion of new sales-tax revenue generated in the first 10 years of the tax. The heavy construction associations in Kansas City and St. Louis and the state association in Jefferson City are pouring hundreds and hundreds of thousands of dollars into the campaign. The “Industry Advancement Fund” on our side of the state has put in more than $600,000 alone. I think this would be a difficult proposal to pass, even if there was no organized opposition. Unfortunately for the proponents, a St. Louis couple — Tom and Debra Shrout, who have deep backgrounds in transportation planning — are running a very effective, highly visible opposing campaign through their Missourians for Better Transportation Solutions campaign committee. I am working closely with them. Their committee is not deeply funded — spending might hit $25,000 — but it doesn’t have to be. On an issue like this, the goal is to simply reinforce people’s instincts that a new statewide sales tax is a terrible way to pay for billions of dollars of transportation projects. The fair way to go is to put before the voters a proposed increase in the state fuel tax, which, at 17 cents a gallon, was sixth lowest in the nation as of last year. In addition, the gas tax hasn’t changed since 1996 — almost 20 years. It is a direct user tax, and that is where those who want more money for the Missouri Department of Transportation should be looking. So, what the hell was the General Assembly thinking about when it proposed a wholesale shifting of the funding burden from highway users to the general population? Well, some people theorize that the proponents were guided by voter surveys showing, purportedly, that a general sales tax was more palatable than a higher gas tax. I don’t believe it for a minute. The sales tax is the most regressive of all taxes, and people are sick of it. I think the special interests pushed hard to put the onus on the general public, and a General Assembly majority caved. You’ve seen our yard signs. Now here’s a look one of the proponents’ yard signs. 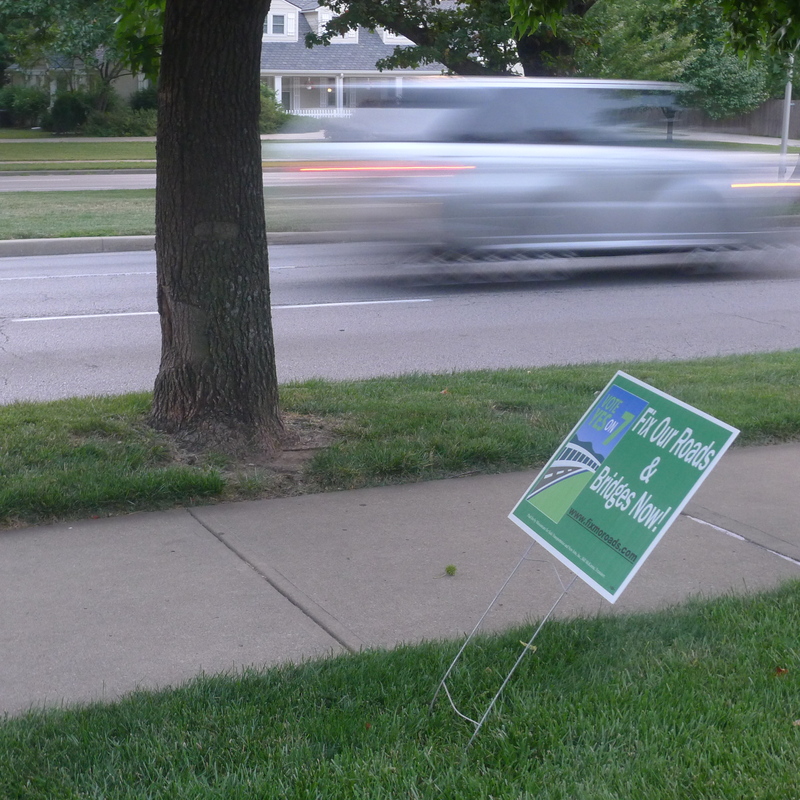 I think that sign is emblematic of the proponents’ entire campaign…listing badly. In addition to the yard signs, we have a really good billboard — 48 feet by 14 feet — on southbound Noland Road at 35th Street in Independence. 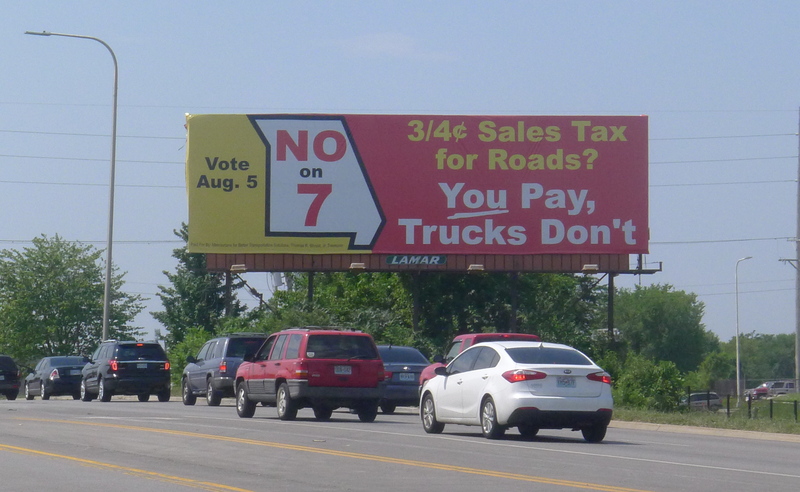 A majority of the Missouri General Assembly and others have resorted to shameful shenanigans in an attempt to convince voters to approve a three-quarter-cent sales tax for transportation. One of the worst shenanigans is the duplicitous ballot language. This change is expected to produce $480 million annually to the state’s Transportation and Safety and Job Creation Fund and $54 million for local governments. Increases in the gas tax will be prohibited. This revenue shall only be used for transportation purposes and cannot be diverted for other uses. That’s exactly what a majority of legislators and the “concrete cartel” backing this unfair proposal want voters to think. The thing is, though, the legislative majority — as well as the heavy constructors, engineers and concrete and asphalt suppliers who badly want to see Amendment 7 approved — have no intention whatsoever of this being a “temporary sales tax” that would expire after 10 years. Just as with almost every other tax that comes along, the framers want this new tax to go on indefinitely. You have to dig into the guts of this pig, though, to find out the framers’ true intentions. Those intentions are laid out in House Joint Resolution No. 68, which the General Assembly approved this year and which authorized the upcoming election on Amendment 7. You get the picture. It would be back on the ballot in 2024. If re-approved then, it would be back in 2034, and so on. 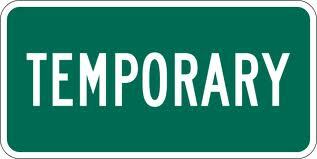 Keep in mind that the ballot language, with that reference to a “temporary” tax, is not the governing language. The governing language is in the resolution, the legal document approved by the General Assembly. So, when you see Amendment 7 on the ballot, just know it’s not as innocent as it appears; it’s a trick and a sham. You might be interested in how the House and Senate voted on HJR 68. On April 29, the Missouri Senate approved the bill on a 22-10 vote. Among area senators, Sen. Jolie Justus of Kansas City voted “no,” while Paul LeVota of Independence and Shalonn “Kiki” Curls of Kansas City voted “yes.” All three are Democrats. The Missouri House approved the bill on a 105-43 vote May 14. One big Kansas City company, The Kansas City Star, and one big political organization, Freedom Inc., have taken terribly mistaken and irresponsible positions on Missouri’s proposed Amendment 7 — the three-quarter-cent sales tax for transportation. Let’s consider each endorsement and the politics behind each. My hopes for a Star recommendation against Amendment 7 got a boost when Lewis Diuguid, an editorial board member, wrote a piece on July 9, reporting that the AAA Midwest Traveler magazine had endorsed Amendment 7. That was an indicator to me that The Star would do the right thing. The editorial board consists of six people — publisher Mi-Ai Parrish, editorial page editor Miriam Pepper and writers Yael Abouhalkah, Barb Shelly, Steve Paul and Diuguid. The publisher always has the final say and can overrule all the others, if he or she chooses to do so. Well, now, that’s just about as exciting a proposition as Kansas City getting the World Cup, isn’t it? The editorial board also fell into the trap that proponents have set by contending that voters have shown a disinclination to raise the gas tax and, thus, the sales tax is the only way to go. “After years of inaction and previous defeats of other funding plans,” the editorial said, “Amendment No. 7 is the pragmatic way to meet the challenge” of transportation department funding. Well, from what I’ve read, the last time a new transportation tax was on the statewide ballot was August 2002, when voters were asked to approve a four-cent-per-gallon gas tax and a half-cent sales tax increase. That went down to a nearly 3-1 defeat. So, proponents’ suggestions that voters would prefer a sales tax to raising the gas tax — at 17 cents, the sixth lowest in the nation — are simply untrue. …So, what happened inside the hallowed walls of The Star and why? It’s this simple: The editorial board allowed itself to be seduced by a city-MoDOT agreement that would funnel $124 million in sales-tax revenue to Kansas City’s proposed streetcar expansion over the first 10 years of the new tax. The editorial board is so enamored of the streetcar project — the closest thing to “mass transit” that we would likely ever have — that it was willing to sell out to promoters of the most regressive type of tax there is. …All of this makes me wonder how Diuguid voted in the endorsement meeting. And I wonder how he felt when he saw the other hands go up in favor of Amendment 7. I hope he put up a fight. As that campaign was developing, I feared that the business community, which came up with that awful proposal, would be able to “buy” Freedom’s support by offering the east-side organization $100,000 or more to campaign for the measure. But Freedom leaders, to their credit, listened to their constituents and took the principled position that a new sales tax was the wrong way to try to make Kansas City a medical research center. The organization came out strongly against the proposal, and it was a turning point in the campaign. This time, I’m sorry to say, Freedom Inc. sold out to the Heavy Constructors, commonly called “the heavies.” They’re called that for more than the obvious contraction of their name. They bring a lot of political pressure to bear in any number of places, including the Missouri General Assembly, which voted to put Amendment 7 on the ballot. I don’t know how much Freedom will be paid to campaign for Amendment 7, but I would guess at least $50,000. Well, whoop-de-do…Seems to me that if those requirements haven’t been monitored and enforced all along, MoDOT hasn’t been doing its job, anyway. And that doesn’t do much for the credibility of the department, which would be getting about $6 billion in new revenue from the new sales tax. And if the General Assembly had done the right thing and put a fuel-tax increase on the ballot, instead of a general sales tax, MoDOT should likewise pledge to monitor and enforce minority- and women-owned businesses’ share of transportation contracts. A week from Tuesday, we Jackson County residents need to show The Star and Freedom Inc. how out of touch they are with their readers and their constituents. I believe we — and voters statewide — are going to do just that. 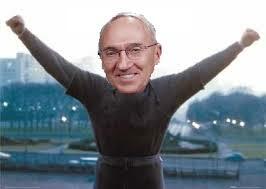 I never thought I would find myself on the same side of an issue as Rex Sinquefield. The multi-millionaire (maybe billionaire) from the St. Louis area is about as conservative and libertarian as a person can get. His overall goal is to see state taxes restructured by dumping the state income tax and replacing it with a greatly expanded sales tax. In other words, he would like to shift the tax burden from the wealthy to middle- and lower-income residents. His philosophy? Let those who are eating cake pay more for their cake, while my buddies and I — who make truckloads of money off our investments — get a nice break. But on Amendment 7, Sinquefield opposes a new three-quarter-cent sales tax to raise more than $6 million over the next 10 years to finance an array of transportation projects. It being his tax or choice, I’m not sure why he opposes it, but I suspect it’s because if Amendment 7 passed, voters would be less likely to approve the even-higher sales taxes that he envisions. Kind of like Brad Bradshaw’s reasoning last year when he poured a couple of hundred thousand dollars of his own money into the successful effort to defeat Jackson County’s proposed translational medical research tax. The lawyer/doctor from Springfield favors a statewide sales tax for medical research, and if the county’s tax had passed, it would have made passage of a statewide tax extremely difficult. An article published today on the Show-Me Institute’s website took issue with some Amendment 7 proponents’ assertion that Missouri’s roads and bridges desperately need repair. The writer, a man by the name of Joseph Miller, cited two foundation reports that ranked Missouri’s highway system as seventh and eighth best, respectively, in the nation. You got it, Rex, this tax would be eminently unfair. So, let’s team up and beat the crap out of it on Aug. 5. Then, I’ll take a good, long shower and go back to calling you the turd in the punch bowl.